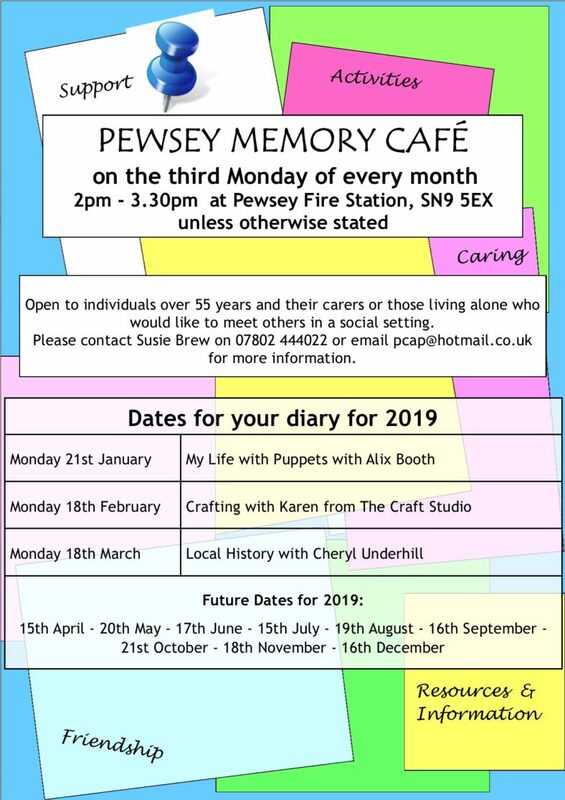 The monthly Pewsey Community Memory Café for February 2019 is on Monday 18th February 2019 at The Fire Station, North Street, Pewsey. The theme for this month’s Cafe is Crafting with Karen from The Craft Studio. Open to anyone over 55 years with memory issues (and their carers) or those living alone who want to meet others in a social setting. The cafe takes place on the third Monday of every month from 2pm to 3.30pm at Pewsey Fire Station, with a different theme at every cafe. An Occupational Therapist will be on hand to talk to. Please contact Susie Brew – PCAP coordinator -pcap@hotmail.co.uk tel 07802 444022 – to book a place, to make a donation or to volunteer to help.